An elf is offering carrots to a rabbit in the illustration by Harald Wiberg shown on one of the five stamps in Sweden’s Christmas booklet. The coil stamp in Sweden’s Nov. 10 Christmas issue pictures an elf with a bowl of porridge. An elf flies a plane through snowy skies on this Christmas stamp from Latvia. The first-day cover for Denmark’s Pixies Christmas stamps. Aland’s two 2016 Christmas stamps depict Maja Lindberg’s illustrations of snow-covered scenes featuring elves preparing for the holiday. Elves and pixies make an appearance on new Christmas stamps from Sweden, Aland, Denmark, and Latvia. Barn elves are pictured on Sweden’s Christmas stamps issued Nov. 10. Part of Scandinavian folklore, barn elves are described as “solitary, mischievous domestic sprites responsible for the protection and welfare of the farmstead and its buildings” on the website of Ingebretsen’s, a Minneapolis retail business dedicated to Scandinavian foods and products. Sweden’s Christmas coil stamp shows a red-hatted elf carrying a large bowl of porridge. The stamp is inscribed “Julpost,” and pays a special reduced rate for Christmas mail (6 kronor). Five booklet stamps that are similarly inscribed depict the barn elves with animals: a cat, rabbit, dog, moose, and fox. The stamps are se-tenant in booklets of 10. Views of a minimalist Christmas: keeping the stamp designs simple: For this year’s Christmas stamps, several world postal administrations appear to have taken a minimalist approach in design. The designs by Eva Wilsson are based on illustrations by Swedish artist Harald Wiberg (1908-1986). Among the children’s books he illustrated are The Tomten and The Tomten and the Fox by Astrid Lindgren. Aland shows a more modern interpretation of elves on its two Christmas stamps issued Oct. 10. These designs are by another Swedish illustrator, Maja Lindberg. “I wanted to create a sense of Christmas in my illustrations. A wintry scenery under a starry bright sky and tiny Christmas elves preparing for Christmas,” Lindberg said in Frimarken, Aland Post’s bulletin for collectors. The nondenominated Julpost stamp depicts three elves decorating a tree outdoors. The international-rate stamp, inscribed “varlden” (world), shows an elf and a reindeer carrying wrapped presents. A church is pictured in the background of the snow-covered landscape. Cartor Security Printers printed Aland’s Christmas stamps by offset in sheets of 40 (two panes of 20). An illustration of elves pulling a tree on a sled is included in the selvage between the panes. One of Latvia’s two Christmas stamps issued Nov. 25 shows an elf flying a propeller plane on a snowy night with a doll and teddy bear seated behind him. 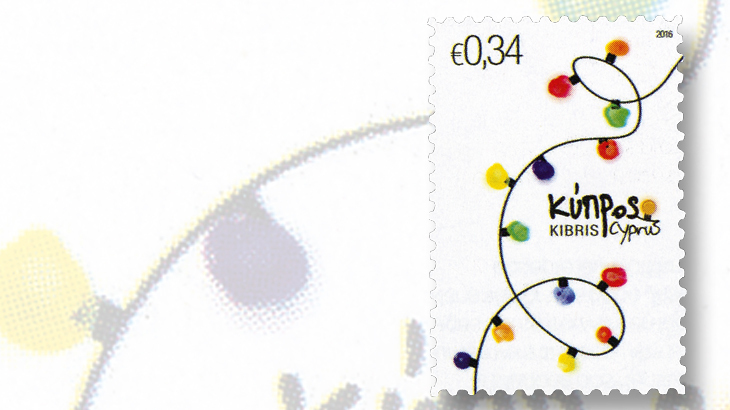 Children’s book illustrator Anita Paegle designed this €0.50 stamp, and Latvia’s €0.78 Christmas stamp depicting a man and rooster. The former stamp is for domestic mail, and the latter for mail to other European countries. Although they appear similar to elves, like their bowls of porridge, and take care of houses and farms, the folklore characters shown on Denmark’s Christmas stamps issued Sept. 29 are called pixies. The designs are based on 19th-century illustrations by Peter Moller. Two of the designs feature dancing pixies. On one stamp, a pixie is dancing with a cat, and on another, two pixies dance together while a third plays an accordion. The other stamp designs feature a pixie musical quintet, a pixie with two baskets full of gifts, and a pixie and a dog. Each stamp bears a denomination of 8 kroner. Gustav Martensson designed the stamps. They were printed by offset.